This post is sponsored by Son de Flor, a slow fashion clothing company that specializes in creating timeless, elegant wardrobe classics. For generations, the “Little Black Dress” has been adored by many, with the power to make any woman feel effortlessly elegant. Because of its simplistic nature, the “Little Black Dress” lets your true self shine through, rather than conceal it behind bold patterns or bright colors. The “Little Black Dress” is many things — timeless, subtle, empowering, sophisticated, versatile — and can be found in almost every woman’s wardrobe for these very reasons. Enter the most whimsical “Little Black Dress” from Son de Flor. Inspired by the nostalgia of summer, the Pinafore Dress is constructed out of a soft, heavyweight linen and features a romantic, high waisted bodice, a twirl-worthy skirt, wood buttons, AND pockets (a dream come true)! I don’t typically consider myself a “long dress” type of gal, so I was pleasantly surprised by how much I loved this dress the moment I slipped it on. Being only 5’5”, I normally feel rather stout in longer dresses, but this one actually elongates my body, hitting my curves in all the right places. The overall silhouette is subtle, yet unique, and will be perfect for wearing with sandals or flats on a beautiful summer day or dressed up with heels for an art opening or date night. Made to be worn beyond spring and summer, the Pinafore Dress also layers beautifully with a shirt underneath. For this look, I paired it with the Peter Pan Collar Shirt in natural linen, which is equally charming. 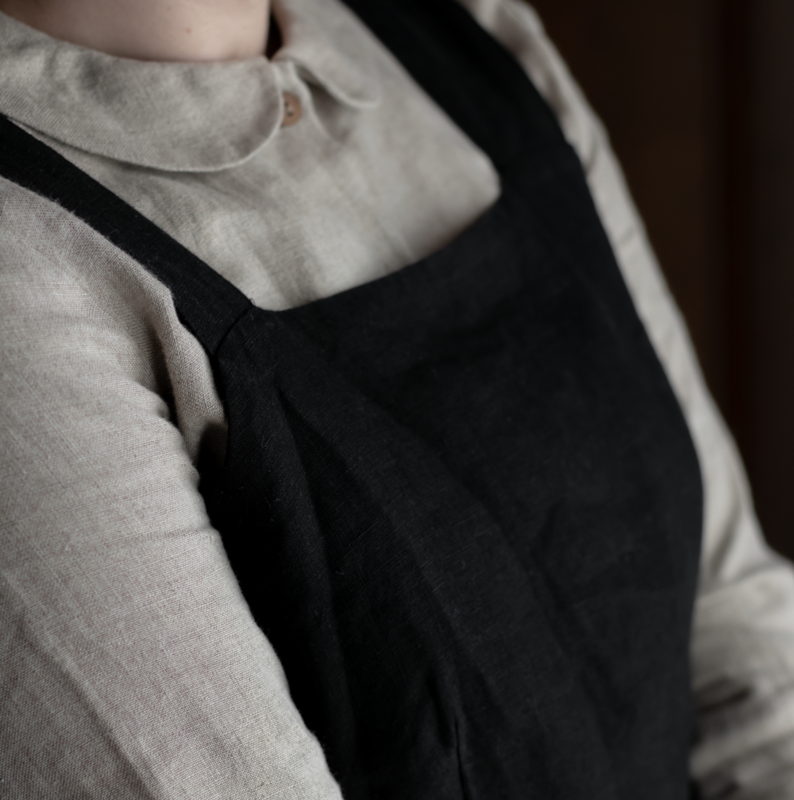 Made with high-quality washed linen, this button up is relaxed, yet refined, and the rounded collar adds the perfect feminine touch. 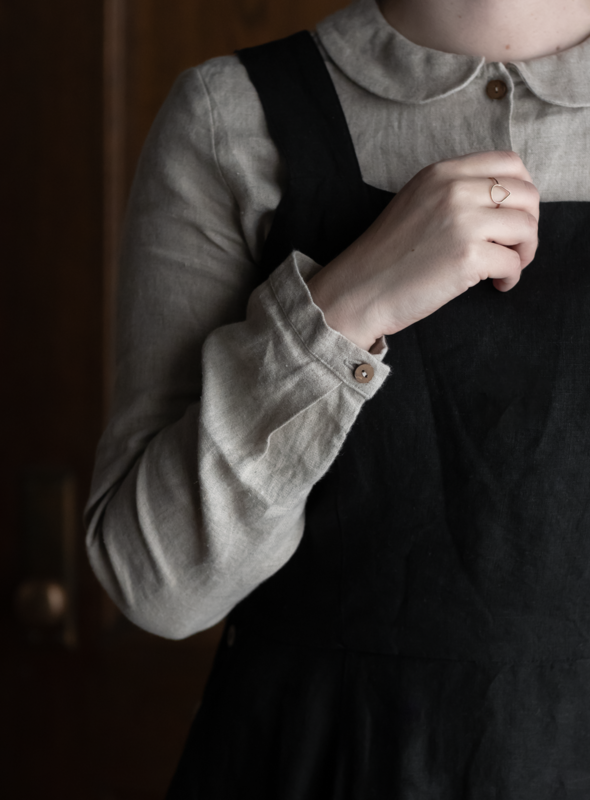 In addition to layering it under the Pinafore Dress, I’m excited to style the Peter Pan Collar Shirt with my favorite thrifted trousers for a simple, vintage-inspired look. MOTIFIED readers can GET 10% OFF their first Son de Flor order with code ‘MOTIFIED’ now through May 9! Son de Flor’s story is similar to that of the “Little Black Dress.” It was started by two sisters — Vaida and Indrė — who were looking to combat the rapidly-changing seasons of the fast fashion industry by creating timeless, elegant clothing that can be passed down for generations. From the use of flax linen to the romantic silhouettes, Son de Flor’s collection is heavily inspired by classic styles that transport you back in time. One of the things that immediately stood out to me when I discovered Son de Flor was their commitment to the treatment of their workers, as well as the environment. Son de Flor creates all of their garments using natural fibers, most notably flax linen. Particularly in Lithuania, the traditions of flax cultivation and processing go back thousands of years, and it even holds a special place in Lithuanian folklore. Son de Flor sources their linen from a local producer that uses Oeko-Tex®100 certified, EU-raised yarns. Each garment is then sewn in a local factory that provides respectful working conditions and salaries, and then stone-washed and softened by a small family-owned company. In an effort to reduce plastic waste, Son de Flor opts for plastic-free packaging that is absolutely beautiful (and makes you wish every package looked this pretty). This post is sponsored by Son de Flor. As always, all opinions are my own and I selectively work with brands that share the same values when it comes to ethical and environmental responsibility. Thank you for supporting brands that support MOTIFIED!